There is no mention of Mavers from the 5th through the 15th centuries. This means we’re not sure where the Mavers fit in to one thousand years of Scottish history. The current state of genetic genealogy research only reveals populations before this time period, and historical records don’t go back this far. The one connection Mavers have to this time period is the possible use of the Maver surname as the Gaelic title for the steward of a kingdom. 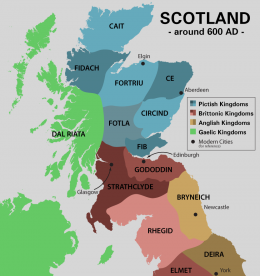 In 600 AD, the land of modern-day Scotland consisted of the kingdoms of the Picts, who inhabited the area north of the Forth-Clyde line (collectively called Pictland), and the kingdoms of Gododdin and Strathclyde to the south. The Picts are generally recognized as the descendants of the Caledonians. Goddodin and Strathclyde is associated with the Brittonic tribes who lived in the land between the Roman-built Antonine and Hadrian walls, the Votadinii and Damnonii. 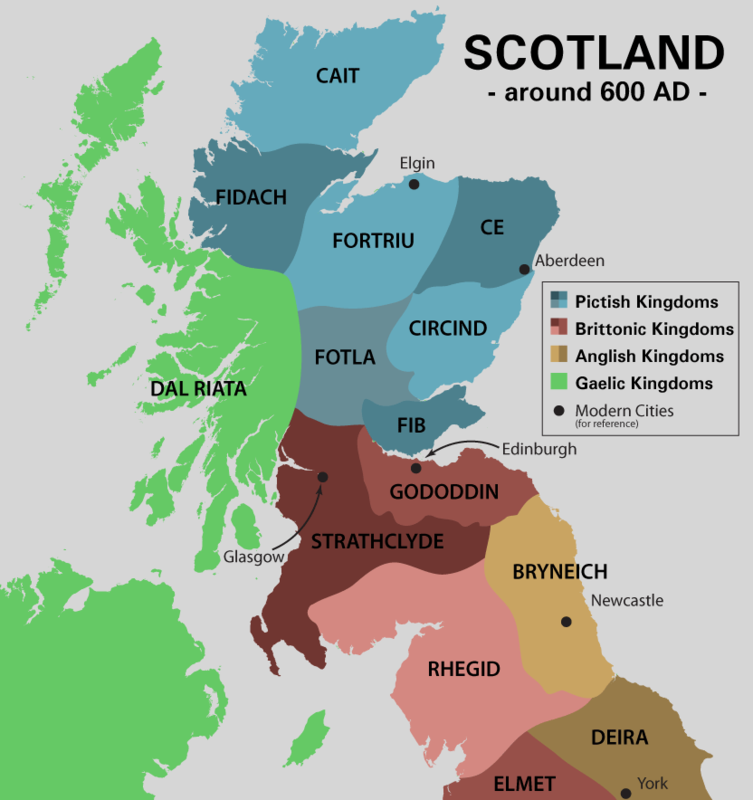 During this time, the Gaelic-speaking (Gaelic being related to, but separate from, Brittonic Celtic) kingdom of Dal Riata was formed by the Irish, who established themselves in the western islands of Scotland, and who also began to encroach on the Isle of Britain itself. These Gael settlers from Ireland were called Scoti. 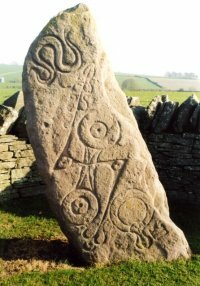 The Picts are referred to in a number of Irish and British manuscripts, and a list of their kings survives in the modern day. However, they left no written history of their own; their most lasting record is an enigmatic collection of symbols found carved on dozens of standing stones throughout Scotland and adorning a number of silver decorations. The Picts were divided amongst seven kingdoms: Cait, Ce, Circinn, Fib, Fidach, Fotla and Fortriu. The most powerful kingdom among these was Fortriu. In some manuscripts, the king of Fortriu is equated with the king of the Picts. The land of Fortriu is around modern-day Moray, Banff, and Easter Ross. The title given to the kings of Fortriu was Mormaer, Gaelic for “great steward” (mor = “great”, maor = “steward”). In 839 AD, there was a major battle between the Picts, led by Uen, son of Oengus of Fortriu, and the Vikings. Uen was killed along with his brother Bran and many others, leading to a dispute between rival claimants to the throne of Fortriu. Kenneth MacAlpine, a nobleman descended from both Picts and Dal Riata Gaels, became the King of the Picts in 843. He succeeded in joining the kingdoms of Pictland and Dal Riata, and thus is regarded as the first King of Scotland--named for the Scoti of Dal Riata. The former kingdoms of the Picts became earldoms of the Kingdom of Scotland; Fortriu became the Earldom of Moray, and the leader of the Earldom continued to be titled Mormaor. The joining of the kingdoms also caused the widespread use of Gaelic, rather than Brittonic, as the common language of Scotland. In Black’s The Surnames of Scotland, he states that Maver originates from the area around the river Spey in Moray, and that the surname comes from the Gaelic Maor, meaning “a steward.” Sir Thomas Inness of Learny, the Lord Lyon King of Arms, agreed that the name originated in Moray, saying that the Mavers may have been, “original Moray men, Maverston perhaps being their fee-land [land given to them in return for their service as steward to the kingdom].” He thought that the Mavers lived in Moray long before the arrival of the Innesses in 1160. Black stated that the Gaelic Maor became Mawer, which in turn became Maver or Mavor. Given the history of the name and the location, it is possible that the Mavers are descendants of the Pictish stewards of the Kingdom of Fortriu. There is still a significant gap for the Mavers in the history of Scotland. The importance of the Earldom of Moray waned under a united Kingdom of Scotland. Scotland was under constant threat from the Vikings, the Normans and later, the English. If the Mavers did indeed live in Moray throughout this time period, their history is no doubt closely linked to that of the Innes, Dunbar and Gordon families that controlled the largest swaths of land in this area after the reign of King David I of Scotland.